The #1 Kids Growing Strong plant project…. 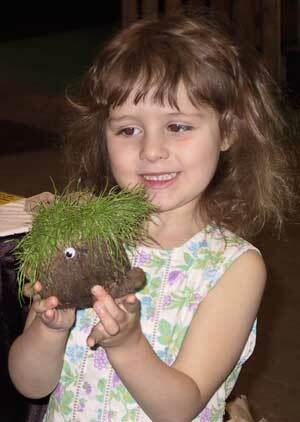 Making a “Grass Buddy” is really easy. Cut the knee-high in half. You will then have one half that has the sewn-up toe of the stocking and the other will be open on both ends. NOTE: If you knot one of the ends of the half that does not have the closed toe, you will then have two halves you can use to make two buddies. Put grass seed down into the closed end of the stockings. The grass will grow and be the hair. Rye grass grows the fastest, but any grass at your local hardware store will work.Put at least one heaping tablespoon into each stocking. If you put too little, you will have a bald head. If you put too much, you will have a shaggy-dog buddy. 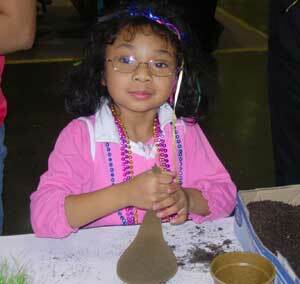 HINT: All seeds need water to break open and begin to grow (see “GERMINATION” to learn more.) If you soak the seeds overnight before you plant them, they will swell with water and break open and grow much faster. 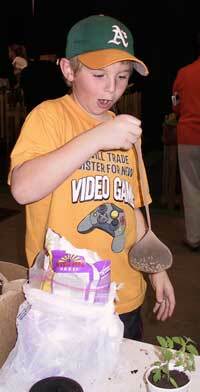 Now add about one cup of potting soil. Any potting soil will do. Grass is easy to grow and grows just about anywhere! Tap the stocking on the table to get the seed down with the soil flat next to it. Tie a knot in the stocking so the grass will stay inside when you turn the stocking over. That’s it! Turn it so the grass seed is on top. The part of the stocking hanging down from the head will serve as a wick to draw up water. Decorate the head to personalize your buddy as you please. GO WILD with your plant! You can draw, shape or add ears and a nose. Whatever! Use permanent markers or paint that will not come off in water. At home, soak your Grass Buddy in water until the ball is wet all the way through. Select a cup, tin can or other container that’s about the right size to hold the head without allowing it to fall in. Add water to the container and place the head upside down on the cup above water with the open end of the knee high in the water and the grass on top so it can grow up like hair. You can decorate the container like a body. If you want to keep it simple, you can skip the cup and just place the ball in a bowl of water so it stays wet. Place your Grass Buddy on a bright windowsill and water the top of the head when needed. You should start seeing the grass seed sprout out of the top of the head in about ten days. After the grass starts to grow on your Grass Buddy, you can use scissors to cut the grass like hair. 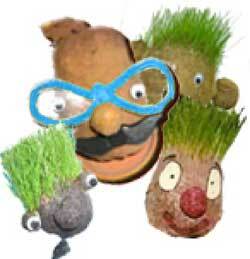 Get creative with new haircuts as the grass grows. 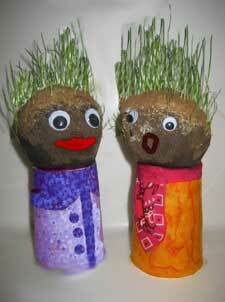 You can give your Grass Buddy a crew cut or a Mohawk or even braided dreadlocks. Whatever you do, remember to keep it moist so it doesn’t dry out. (plants can be up to 95% water!) and give them sunshine to keep growing strong.